Registration will open soon. Stay tuned and check back atthis site. The purpose of this workshop is to present state-of-the-art pathogen detection technologies, emphasizing the need for standards relevant to the clinical diagnostic and biothreat detection stakeholder communities. We feel these two communities share many of the same measurement challenges (e.g. assessing sensitivity and specificity) and this workshop will serve as a venue for an exchange of ideas and open discussion on the general topic of measurement assurance for pathogen detection. Speakers will include subject matter experts from industry, academia, and government. 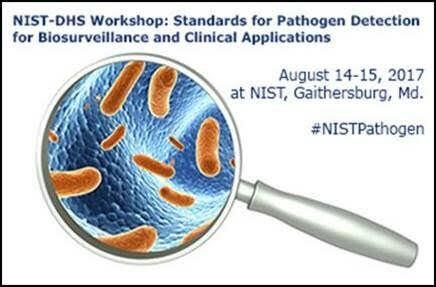 This workshop builds upon previous NIST-hosted workshops focused on pathogen detection and identification. Please feel free to share this announcement with you colleagues. This is an open workshop.